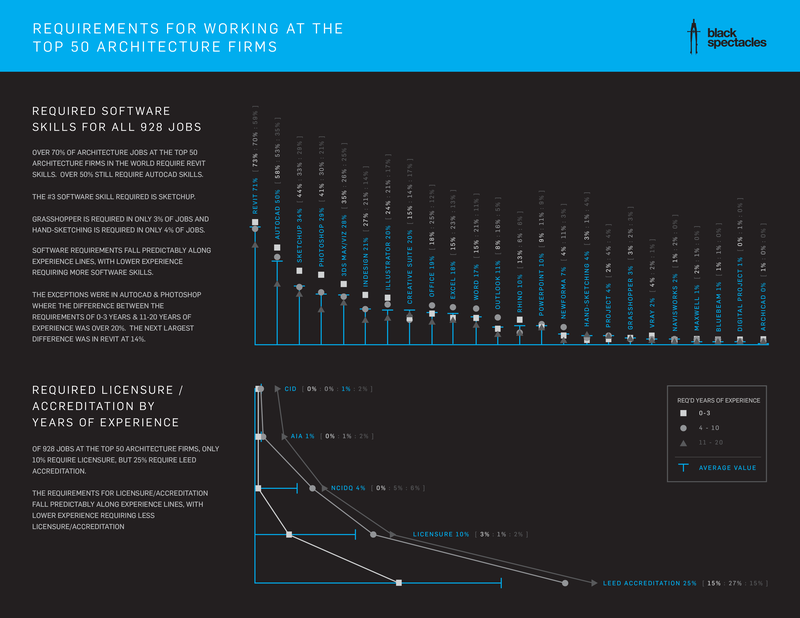 We surveyed 928 job postings at the top 50 architecture firms, based on Architectural Record's July 2013 Top 300 Architecture Firms study, and compiled the software requirements and the licensure/accreditation requirements listed for each job. We then sorted them by average, and then by the experience level required, from 0-3, 4-10 and 11-20+. The results are in the infographic below. Compare this to our new 2016 study as well. In summary, for software skills, over 70% of architecture jobs require Revit skills, and over 50% still require AutoCAD skills. The #3 software skill required is Sketchup. We must admit that we were disappointed (but not surprised) to see that Grasshopper was only required for 3% of the jobs. And good old-fashioned hand-sketching was only explicitly called out in 4% of these jobs. Software skill requirements fell predictably along experience lines, with lower experience requiring more software skills. The exceptions were in AutoCAD & Photoshop where the difference between the requirements of 0-3 years & 11-20 years of experience was over 20%. The next largest difference was in Revit at 14%. For licensure/accreditation we were very surprised to see that only 10% of jobs required licensure, but 25% required LEED Accreditation. The requirements for licensure/accreditation fell predictably along experience lines, with lower experience requiring less licensure/accreditation. Below is a list of the firms that were surveyed. We took the top 25 Architecture firms and the top 25 Architecture + Engineering firms for our survey. This survey is obviously skewed to larger firms. We are interested in expanding this survey to smaller firms, and would like your suggestions for where to find a good sample of smaller architecture firms- please add your thoughts in the comments below.